Welcome to a fusion of New Zealand adventure! This is a shared expedition with my friends from Ice Axe Expeditions. 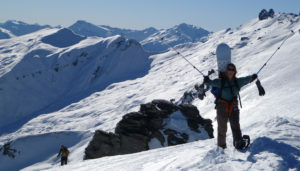 I will lead a 11-day ski touring trip starting from my home in the picturesque alpine town of Wanaka. From there we will travel north to New Zealand’s biggest mountains, Aoraki/Mount Cook before returning to Queenstown. Each day is spent ski touring New Zealand’s amazing alpine tree-less terrain with stunning views down to the grass and glacial lake filled valleys over 3,000 feet below. Access is always an issue in New Zealand where the snow is a long way from the towns and villages. This trip utilizes the local ski areas with single lift rides to get into the backcountry’s most amazing terrain. 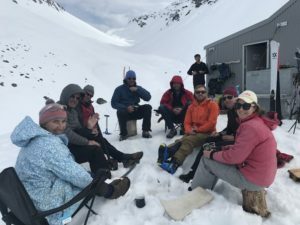 We will also use helicopters to access some of my favorite alpine ski and snowboard touring areas for day trips, and also stay in the secluded Lady Emily Hut for two nights. Tours will depend on the groups fitness and abilities, but expect upwards of 700 to 1000m (2,000 to 3,000 feet) a day. There is the option of doing big or small tours depending on the weather and conditions. The skiing in September will be spring like with great corn, or even fresh powder. Sometimes both on the same day (different aspects)! Length of Trip: 11 Days. Trip Dates: September 17-27, 2019. Please note this itinerary could potentially change depending on weather and snow. Day 1 Arrive into Queenstown International Airport via Auckland. Shuttle transfer to Wanaka (1hr). Stay Matterhorn South Lodge and Backpackers. Meet by your guide, Mark Sedon for trip welcome and briefing. Dinner cooked in hotel kitchen. Day 2 Ski tour behind Cardrona Ski Resort. Cardrona is less steep than TC, but has some great back bowls that hold good snow through to the end of September. Leave town at 8:00am (1hr drive). Packed lunch. Return about 5:00pm. Dinner cooked in hotel kitchen. Day 3 Ski tour near Treble Cone Ski Area, the closest ski area to Wanaka. 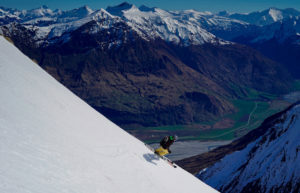 TC as it’s known, is the largest ski area in the South Island, boasting one of the longest vertical rise in New Zealand. It’s steep and the touring behind the resort is some of the best in the country. We’ll leave town at 8:00am (1hr drive). Single lift ride provided to access the backcountry. Packed lunch. Return about 5:00pm. Dinner cooked in hotel kitchen. Day 4 Heli accessed ski tour in Buchannans Range, fly in and out day trip. About 9:00am we’ll fly to the summit of Mt Alta (2339m/7,680ft) and ski it’s cold south face (remember aspects are opposite in New Zealand). Then we’ll tour up to the summit of the Buchannan Peaks for a few more runs, working our way back towards the heli base. Then when we get tired, or run out of day light, we’ll get picked up by helicopter at the snow line and flown back down to the valley (3,000ft below). Packed lunch. Return about 5:00pm. Dinner cooked in hotel kitchen. 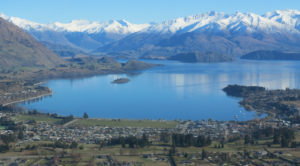 Day 5 Leave Wanaka at 7:00am, drive to Ohau Ski Area (2hrs), single lift ride to access back country. Packed lunch. After skiing stay in Ohau Lodge, dinner provided by lodge. Day 6 Drive to Round Hill Ski Area, single lift ride to access back country, return to NZAC hut at Mt Cook Village, dinner cooked in lodge. Day 7 Helicopter access to Lady Emily Hut, a newish hut built on private land with a fire and cooking gas. Ski tour Liebig Range. Day 8 Ski tour in area. Day 10 Ski tour behind Remkables Ski Area (1hr drive). Packed lunch. Return about 5:00pm. Basic dinner included at local restaurant. Day 11 Depart for home.